We love this recipe! 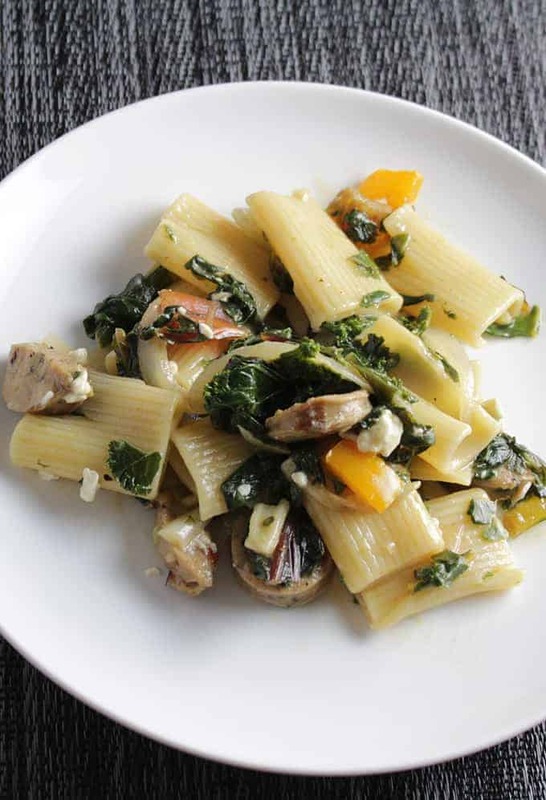 We have posted an updated version of our Rigatoni Chicken Sausage and Collard Greens recipe here, with a few tweaks. Both versions are good! After going for steak a few weeks in a row for our Saturday supper, I was ready for something a bit more budget friendly last weekend. A nice hearty pasta seemed like the thing. 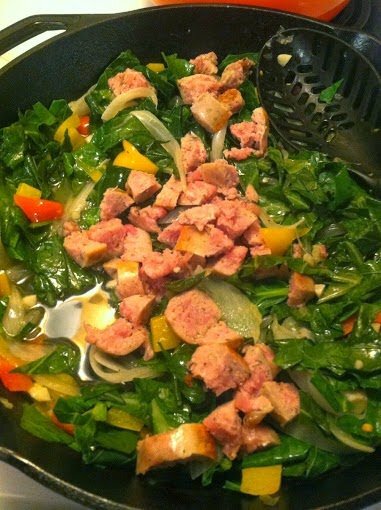 Building the recipe around chicken sausage and collard greens, both only, gave a healthy, low-cost base to the meal. A moderate amount of bacon and feta keep it fairly healthy while adding some nice flavor. 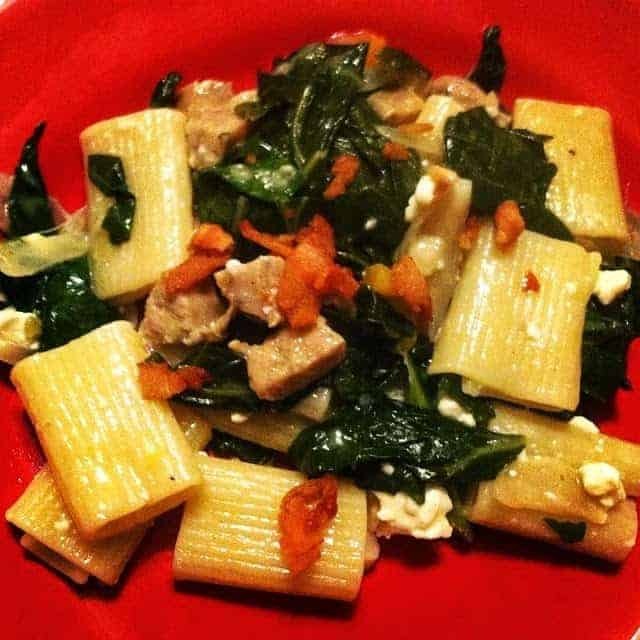 All told, this Rigatoni with Chicken Sausage and Collard Greens is a winner! You could substitute other substantial greens here. Of course, you could use pork sausage too if you had it on hand. Coat a large skillet with oil spray and heat on medium. Cook the bacon until it gets nice and crispy. Remove the cooked bacon to a plate covered with paper towel. Drain the excess bacon fat from the pan–but leave a bit for flavor! When the bacon cools, crumble it to add to the pasta at the end of the cooking process. Return the skillet to heat. Add a bit more oil spray, and add the sausage to brown. Turn over occasionally and cook until it’s browned on all sides. Remove from heat and set aside on a plate for later. The sausage I used wasn’t precooked. If that’s the case with yours, be sure to complete cooking it through at the end of the dish. After it has cooled, slice the sausage into thin circles to be ready for use. Heat the skillet on medium with one tbsp of oil. 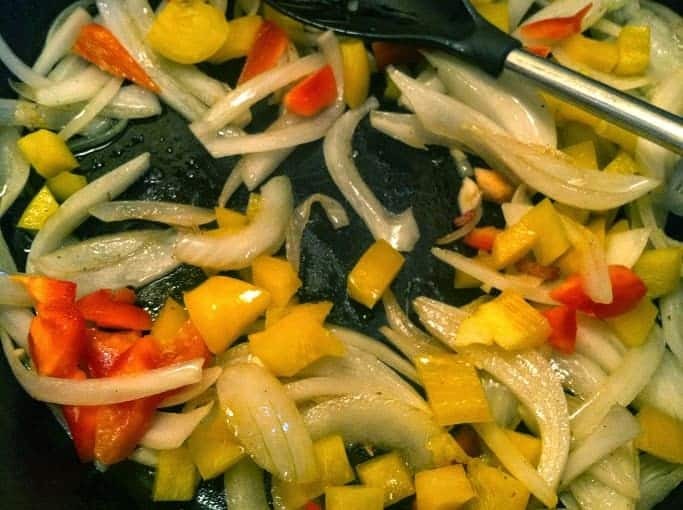 Add the onion, cook for about 5 minutes, then add the celery and peppers. Saute for another 5 minutes, then add the garlic. This is a good time to start the pasta water boiling. 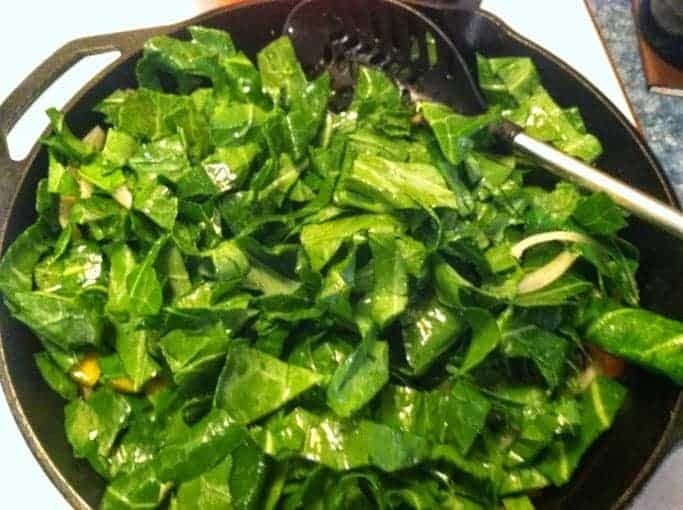 After the garlic has cooked for a minute or two, gradually stir in the collard greens on medium high heat with, along with a pinch of salt, pinch of red pepper flakes, and another tbsp of olive oil. After the collards have start to wilt a little, and you’ve got them all in the pan, stir in the chicken stock. Once the stock begins to boil, lower heat to medium low and cover to simmer. The greens should simmer for about 20 minutes to get nice and tender. About halfway through, begin cooking the rigatoni according to package instructions. When the greens are about done cooking remove the cover and stir in the sausage to finish cooking them and get the flavors melding together. Cook the sausage and green mixture for about 5 more minutes, uncovered, until the sausage has cooked through. Drain the pasta when cooked, and stir in the greens mixture along with the cheese. Plate the pasta, topping with the reserved bacon crumbles, and enjoy! Wine Pairing: A full bodied white works well with the flavor combination here. A chardonnay would probably work, but I went with white Rhone style blend here, and that was a good pairing.